My God, it's good to have the Chiefs/Raiders games mean something, isn't it? Especially when you compare it to the current state of the classic Packers/Cowboys showdown, where it looked like Green Bay starters against their taxi squad. I don't give much truck to the KC/Oakland rivalry being "the best rivalry in football," which is a phrase that's somewhat fallen out of favor since the days Los Angeles had a team. Neither has been consistently good since the early 90s, and they haven't been able to put together fluke season at the same time. The twice-annual showdown hasn't really meant much since the QB matchup was Jeff Hostetler vs. Joe Montana. But it was indeed a real rivalry, and we respect that. Oakland fans are easy to hate, so it was simple to pick a side. 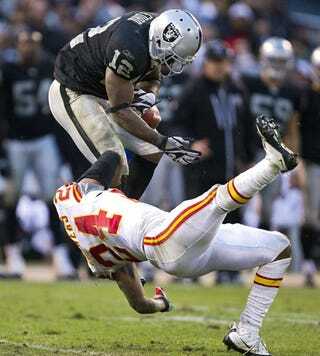 And Chiefs visits always got the fools in the Black Hole riled up, which made for good TV. But the last decade-plus has been ugly. Neither team has mattered, and the only stakes have been not finishing last in that division. So it was great to see yesterday's game with the AFC West lead on the line. In Oakland, sold out, with both teams taking penalties right and left. (A combined 240 yards; most of it was for sloppiness rather than assault, but we'll take it.) And though it came down to a kicker, which would normally be a very unrivalrylike ending, at least it was a ne'er-do-well who made good. And then we have the Cowboys. They looked damn good on paper to start this season, and anyone who says otherwise is no better than Captain Hindsight. So it's no surprise NBC would want them for their Sunday night game, especially against the team they dominated throughout the 90s en route to a dynasty. Yes, this one dates back to the Ice Bowl. Maybe NBC should have popped in a tape of the Ice Bowl instead of whatever that was last night. Certainly not professional football. What's wrong with the Cowboys, Jerry Jones? "I can't put my finger on it because I don't have enough fingers." What happens next, Jerry Jones? "There are a lot of people here who are certainly going to suffer and suffer consequences." Translation: Wade Phillips is gone, but we're not going to let Jason Garrett try too hard and bumble his way out of landing Patrick Peterson. But this is the NFL, where everything comes around. The Cowboys will one day get good again, just as the Packers and Chiefs and Raiders managed to do. And if Jerry Jones is lucky and has a little Al Davis in him, he'll live to see it. What The Hell Happened To The Lightning?